At the one-year mark of his tenure as Flagler Beach city manager last January, Larry Newsom was short-listed for the county administrator’s job in Jackson County in the Panhandle. He’d also applied for the top job in Port St. Lucie. Just past the 18-month mark of his tenure, he’s been short-listed for the top job in Putnam County, where he is the list’s “alternate” behind four individuals, all of whom are being introduced to Putnam residents in a meet-and-greet on Aug. 10. One of the people responsible for the search? Flagler County Administrator Craig Coffey, who is facilitating the search as an appointee of the Florida Association of County Managers. 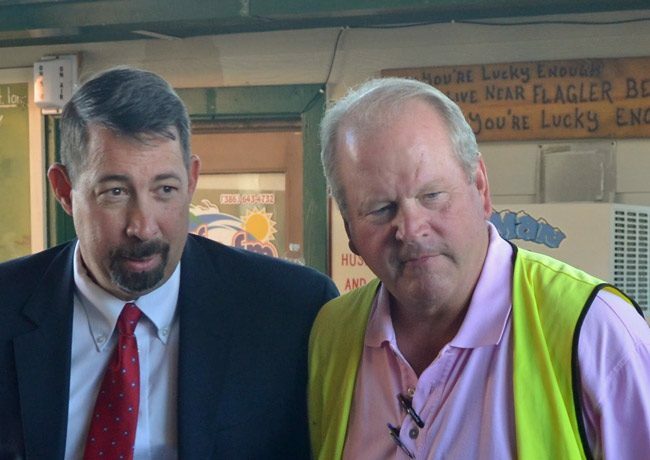 Coffey and Newsom have been working closely on dune restoration in Flagler Beach, and were meeting on the issue with state officials earlier this week. But another ongoing concern is also playing a role in his decisions: he is looking to reenroll in the Florida Retirement System, which would be an added benefit to him and to his wife. Flagler Beach does not participate in the system. “At the end of the day it’s not about me, it’s about my wife,” he said, a reference to his wife’s health concerns. Failing re-enrollment in the retirement system, he is also looking to improve his pay. He is paid $90,000 a year in Flagler Beach, down from the $116,000 he earned as assistant county administrator in Escambia County, his previous job. The Putnam job’s salary range is between $120,000 and $140,000. He was paid $116,000 assistant county administrator in Escambia County. He resigned from that job in 2014. He repeatedly said he was not dissatisfied with the job in Flagler Beach, though he would clearly welcome higher pay: his job applications could be a signal to commissioners that he is angling for a raise. Commissioners there have always known that they are at a competitive disadvantage with the pay they provide: the more satisfied they are with a top executive, the less likely they are to hold on to that executive, whose attraction in other government’s eyes is proportional top the praise the executive garners in his current position. Newsom has been garnering substantial praise from his commissioners, particularly as he shepherded the city through Hurricane Matthew. He was asked whether he’d be interested in the city manager’s job in Palm Coast, where the city council is meeting next week to decide the fate of City Manager Jim Landon: that tenure is drawing to an end, though it’s not yet clear how long the council would be willing to stick with Landon as it transitions to another manager—and whether Landon himself would be willing to stick around during that transition, if it’s not on his terms. Newsom was one of 48 applicants to the Putnam job, as the News-Journal, which first disclosed his application, reported earlier this month. This does not add up…. why did he “resign” from a job making $ 116,000 and now wants or needs to make more $$$$ ? Must be more to this story ! Would love to know what really happened. If Coffey is his “godfather” better Palm Coast stay away from him. Oh my god I hope this means Bruce Campbell is NOT coming back.